Self-Publishing and Distribution: Jacqueline Simonds, Part 1. What kinds of marketing or promotion do you do on behalf of your publishers? Marketing is a function of the publisher. 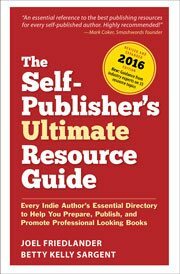 Distributors may place the publisher’s book(s) in that season’s catalog (but may charge a fee), represent the book at trade shows and presentations to wholesalers and bookstores. As mentioned before, we also make an effort to get the book reviewed by pre-publication reviewers. This is a key step for library sale. But that’s the book trade. As we all know by now, bookstores don’t buy books. They rent them on the off-chance they will sell. If they don’t sell in 2-6 weeks, the book is returned. Frequently in unsalable condition. The publisher has to make sure they are reaching their reader/buyer and driving them to bookstores (for traditional distribution) or Amazon or their webpage (for non-traditional). Do you think publication dates and launches continue to be relevant to self-publishers? Well, you need to start somewhere, so a specific launch date is a good place to start—or officially start. Of course, in today’s marketing, you will market the book months before the book is actually available. But think of the book launch as a baptism/celebration of birth. Doesn’t mean you can’t have had baby showers and housewarming parties beforehand! Where the self-publisher/small press has as an advantage over traditional publishers is the ability to grow their brand. Most big publishers give a book 6 weeks to make it. If it fails, it’ll be backlisted for 6 months, then the excess inventory pulped (although they now go to e-books and print-on-demand to keep the title in play). Smaller publishers can work at making their book a success even if sales are so-so at launch. I’ve seen several books that did OK in the first few months, then dropped off. Then 2 years later, sales were stronger than ever. But the strength lay in the author/publisher being willing to change up their marketing and being persistent. Giving up doesn’t sell books. Period. What’s the future of Beagle Bay in terms of the move to ebooks? Is that a threat to your company? I’m guessing your question has to do with the idea that if there are e-books, that means there is no distribution business for me. I don’t really see that. While I think that many books will go to an e-book-only model, I think that paper books will be around for a long time. We see e-books as a win-win for our publisher clients, since they can now reach their customers in many platforms. We see the digital age as an exciting expansion of opportunities for publishers of all sizes. Certain books are best as e-book-only, don’t you think? Things that are time-sensitive and need frequent updating should not be in a paper book. It serves the customer best if information can be updated. This suggests a subscription-based model, rather than just a one-off book sale. Most books with more permanent information will benefit from having several platforms. Not just e-books, but audio and perhaps limited video (how-to books are a natural for this). We’re in a customer-centric model now, where the buyer wants to customize how they receive their information. How does your background as a self-published author help (or hinder) your work with your clients? I know exactly how my clients feel as they enter book publishing. It’s a really steep learning curve, the deck is stacked against you, and right now we’re in a huge paradigm shift where anyone’s guess on the future may be right (or horrifically wrong). But I also get the exhilaration of having written a book. The hope that you can succeed against the odds. The (charmingly insane) notion that you can conquer the world. Been there, done that, optioned the movie (and had the rights stolen). I walk beside my clients and understand what they are going through. What are the most common mistakes you see with self-published books that authors could avoid? The most common mistakes are cheapness, no understanding of basic business and stubborn disregard for the reality of the book business. Those who are cheap think that they can put out an unedited, untypeset book with a clip-art cover and expect to compete with the big publishers—and sell millions. This is setting oneself up to fail. I’ve seen books with bad covers sell, but when they got better covers, they really took off. You have to think competitively: why should your reader/buyer accept your inferior product when they can get the same information (or something close to it) which is better quality (for less money)? If you have never been in business, you have this idea that you can publish a book and sell it for the price that is on the book. This disregards the basic truth about business: if you are relying on anyone else to sell the book, then they must make money on the product to make it worth their while. I hear self-publishers whine all the time: Why do I have to give a discount? Well, you don’t if you are selling directly to your customer. Otherwise, wake up and learn how to do business. Capitalism drives the market. Charge what others are charging in your subject matter—or less, if you can. Similarly, I get a lot of people who think that they can charge $30-50 for a trade paperback. You can, but you won’t sell many. Capitalism drives the market. Charge what others are charging in your subject matter—or less, if you can. Yes, this does mean that you’ll only make pennies per book. That’s why it’s important to focus on selling volume (a lot of books). Lastly, I see a lot of people who flail into the book business with no idea of how it is structured and thinking that they should have instantaneous access the same way Random House does. I’ve seen people scream at Marcella Smith, the small press buyer at Barnes & Noble, that she HAS to put their books on her shelves. Um, no. She doesn’t, and the book industry doesn’t. Again, it’s not a meritocracy. It IS capitalism. Books on bookstore endcaps are there because the publisher spent money ($300-1500 depending). The big publishers spend a LOT of money on advertising. What are you doing to get to your audience into the store to make it worth the bookstore stocking your book (it doesn’t have to cost gobs of money)? And do you really want to mess with bookstores in the first place? Learn as much as you can about the book business before investing your hard work, time and money into it. You’ll still be surprised. What tips would you offer to new self-publishers who intend to make money with their books? Don’t bother to publish unless you are willing to commit to the project 100%. Make sure you are in it to win, not fail. Dream big, dream well as you write. But when it’s time to publish and sell the book, become a hard-nosed business person. This is a really hard thing to do for many creative people. You may need to partner with someone to make everything happen. Don’t rely on hope to sell your book. Do the groundwork to make it happen! Was there a Beagle in Beagle Bay? We named the company after our fabulously barky beagle, Bertie. He thought the phone rang for him, and most callers heard him barking in the background. Here’s his picture. Bertie died in 2009. We adopted Lewis late last year. Although less vocal than his predecessor, that’s a relative measure for a beagle. Lewis likes to bark at people at the door. What’s up with the pirate flag? Originally, it was part of the marketing for my novel, Captain Mary, Buccaneer. Then it became sort of a company attitude, “Take no prisoners! Do or die!” Which seems more extreme than we are. Also, as part of the marketing for Captain Mary and our other woman pirate book, The Witch from the Sea, we aimed to become one of the go-to sources on the web for information about pirates and women pirates. When we discovered that there are a half-million pirate re-enactors in the world, we branched out into a historical clothing bibliography. At one point, we were an important source for historical clothing research. But I haven’t updated that section of our site in some time. Thanks for the opportunity to talk about distribution and self-publishing! And I want to thank Jacqueline for being so generous with her time and experience. There’s a huge amount of information in this interview that can really help you understand how books get sold, and give you some realistic direction about your own book projects. Barbara, thanks so much. We all need a lift now and then, this is not an easy business. Glad to hear you marching off with a little bounce in your step. Have a great day! I’m glad I was able to help re-energize you! It is very hard when you are first starting out to keep your “‘mo.” May I suggest you look for an online magazine publisher’s group? You don’t have to go it alone!